Already posted in Projects but it's not really a project so if a Mod/Admin sees this please merge/delete the other post. So I decided to invest in a CouchMaster Cycon. I have to say it was probably the best choice of my life. 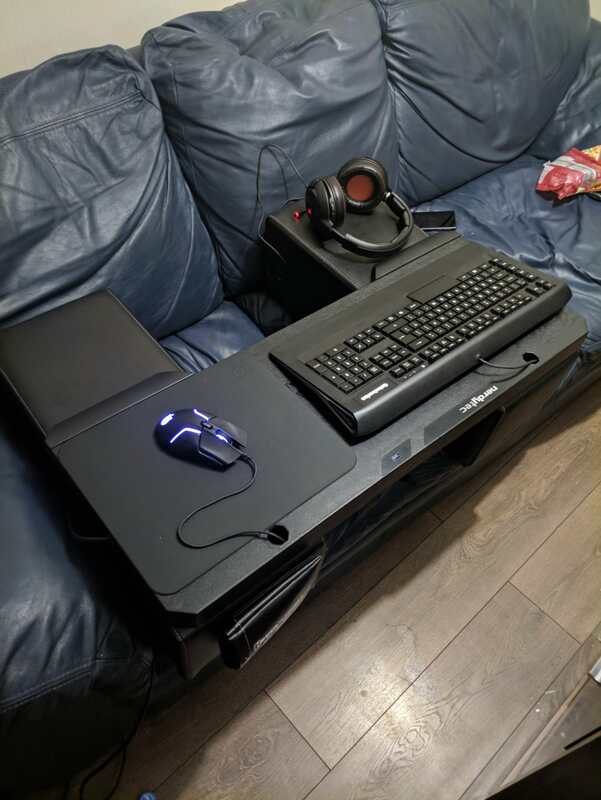 I gamed on a couch anyway using some little table in front of me. After a long gaming session my back would start to kill. The CouchMaster sorted that problem for me right out and is super mega comfy. Steelseries Apex 300 - Tempted to upgrade.. Delivery took about 2-3 days to come from Germany to UK. Overall it's great. When you have a look at it in person it just screams build quality, feels very solid and not cheap at all! Comes with fitting instructions but that is not needed! It's very simple to setup. It tells you on the instructions how to open the box but you need to open the box to get to the instructions. Logic? It's got a 3 port USB Hub inside so I got my Keyboard, Mouse and Controller plugged inside there which keeps things nice and tidy. There is also a 4th port just chilling on top of the CouchMaster but I'm not currently using it. The perks of using the USB Hub is that I can leave my Xim near my Xbox on the other side of the room and just run one cable to the CouchMaster that powers everything. It didn't require any extra power cables and the xim was able to power all the peripherals going through the CouchMaster. Now with the XIM Apex I didn't even need to use the hub that come with the Apex. I just plugged the CouchMaster directly into the Apex. The hub that is inside the CouchMaster does have a DC port meaning you can power it if you want. It's handy if you want to be able to charge your phone from the CouchMaster. It come with a free mousepad which is a nice extra. The mousepad is high quality and has no problems tracking at 12,000DPI. I haven't yet plugged the controller in on this picture. The CouchMaster has 4 holes, 2 on sides and 2 on top. I'm using all 4 currently, my right side is the 15ft/5m extension cable to the CouchMaster, left side is just a Micro USB cable I use to plug the controller in. On top I have my mouse coming out the right hole and keyboard on the left. I honestly couldn't fault this product in any way. The side cushions are also adjustable if you are obese. You can just move them out apart more and stick on the Velcro tape that it comes with. I have to say that it's improved my aim a lot as I was sitting in an uncomfortable position before. Manage to score 3 wins in a row in PUBG, lost one then won another 2 in a row then called it a night. Was gaming for a long time yesterday and experienced no pains at all. The wrist rests are comfortable and there's enough space if you want your own wrist wrests. It comes with a stick-able pocket which I put on the front that is a mouse holder. There is also another pocket on the side that I use to keep my controller in. Unfortunately Microsoft is annoying and won't give us true wireless chat. I need to keep that controller there with a cable plugged into it if I want to use party chat but other than that the headset is wireless. This product also has various accessories you can buy such as, phone holder, tablet holder and ash tray. Overall I have to give this product 10/10. Not only it took my back pains away but it improved my aim a lot and is super comfy. I would recommend this product to anyone who is gaming at a couch. They also do a cheaper version with no hub and no cable management. Perfect if you have wireless mouse and keyboard. The price justifies the comfort. I'm sure it will do well for many years to come! I did a search to see if anyone had used the hub inside the couchmaster. 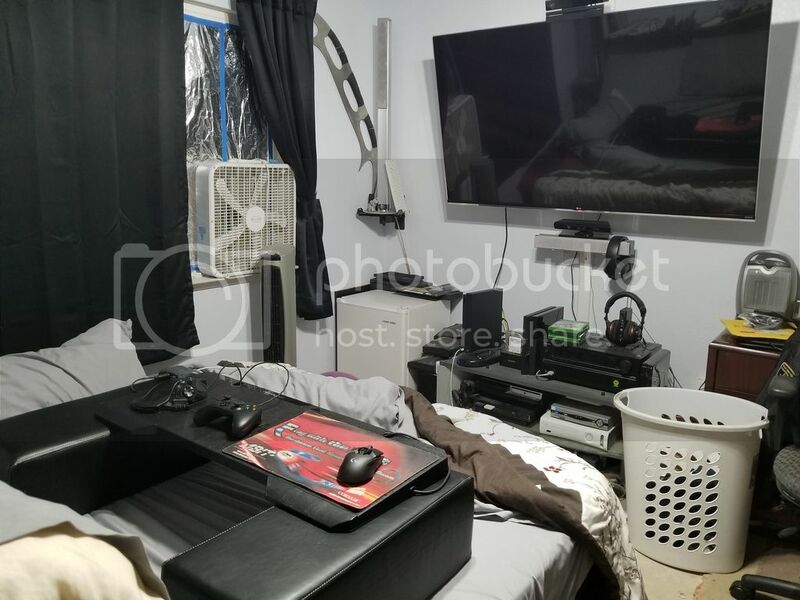 Awesome to see someone else invested in this setup as well. I absolutely LOVE it! While I don't have the apex, it's certainly helped with cable management. 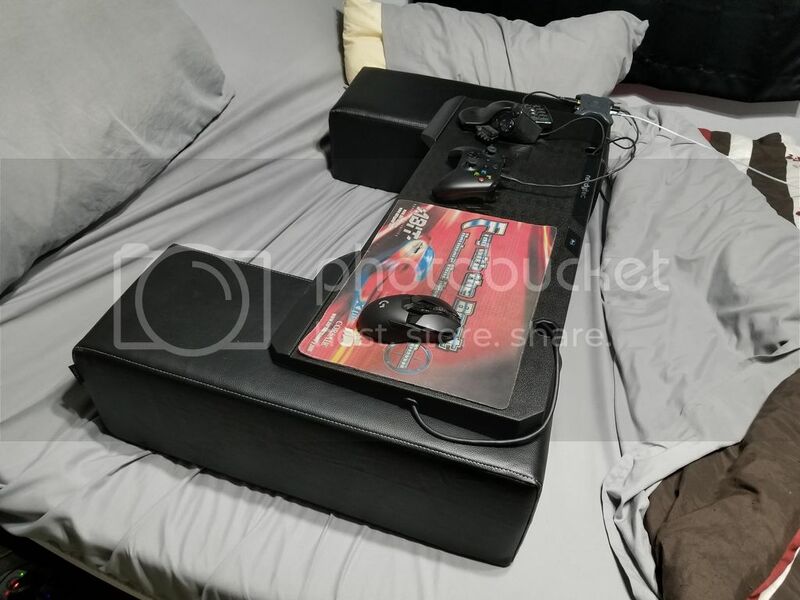 I used to use an old shelf across my lap, and I honestly had NO idea how much my neck was being strained by not having arm support while playing. These cushions are perfect! I sit on my bed (inclined) and was curious to see if this would actually work. Was absolutely pleased!